The Mossberg 590A1 is a riot-busting tactical shotgun ready for extreme LE duty! off with a Nightforce 5.5-22x50mm scope that is part of the kit. The “trench gun” had its beginnings most famously with a modified variant of the Winchester 1897 pump shotgun, designed to sport a short barrel, heat shield and bayonet lug. This design set the standard for military-pattern shotguns, providing a compact and fearsome close-range weapon designed perfectly for the arm’s-length combat of the trenches. Nonetheless, the configuration developed for World War I is now more than 90 years old. So what is the state of today’s combat pump-action shotgun? In the case of the 590A1 model from Mossberg, it is a cutting-edge combat shotgun designed with input directly from the US military and based upon a platform that has passed the US Government’s stringent Mil-Std-3443 shotgun performance requirements, allowing Mossberg 500-based shotguns to be adopted for use by the US military. The 500, the platform upon which the 590A1 is based, has a long and storied history as both a sporting and tactical shotgun. Hardy and reliable, the Mossberg 500 has earned a reputation as a reliable and affordable shotgun, as equally well suited to LE/military applications as it is to the sporting fields. 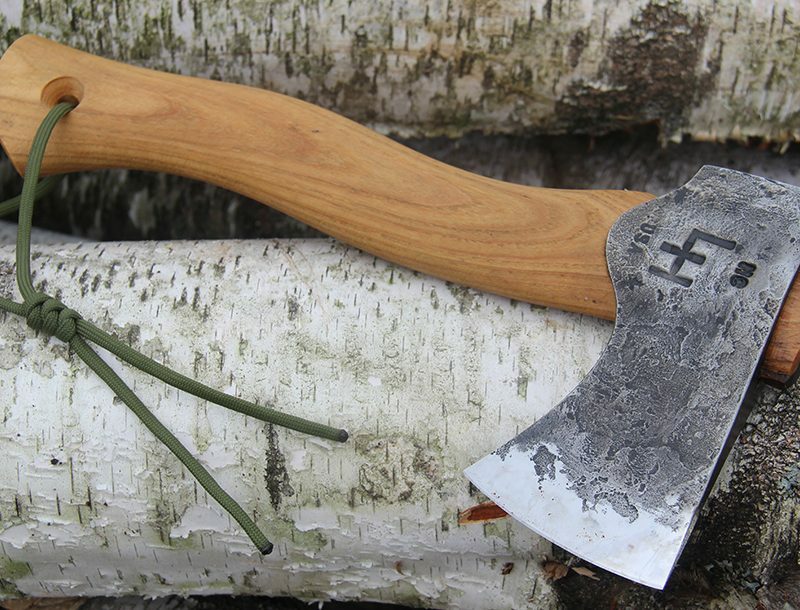 Unlike the relatively low-key appearance of the basic 500, the new 590 featured a very aggressive visage and several combat-oriented enhancements. Sporting a 20-inch barrel similar to eight-shot variants of the 500, the new 3-inch chambered 590 featured a 9-round capacity, with eight 2¾-inch shells fitting in its tubular magazine. The feat of upping the total capacity of the 590 over the standard 20-inch barreled 500 by one shell was accomplished by redesigning the barrel retention system from the standard 500, which employs a retaining screw that attaches to a threaded portion on the forward end of the magazine tube. On the 590, a magazine cap screws onto the end of the magazine tube that features threading on its exterior diameter at its end. The magazine cap is designed to tighten down against a barrel retaining ring attached to the barrel that encircles the magazine tube, with a spring-loaded plunger in the ring’s forward face interacting with “teeth” machined into the rear face of the magazine cap. Located roughly 3 inches behind the forward barrel-retaining ring is a secondary ring that is also home to the other significant enhancement of the 590 — a bayonet lug. To give the shotgun a uniquely military-oriented capability, this lug works in concert with a reduced diameter ring on the front face of the magazine cap (the same diameter as an M16-pattern flash suppressor) to accept a bayonet. For obvious reasons, the 590 was an immediate hit. It offered a robust, capable scattergun that captured the spirit of the original 1897 trench gun, but in a synthetic-stocked and modernized form. However, for some members of the US military whose needs for this type of shotgun would push any gun to its limits, there was still a little room for enhancement. 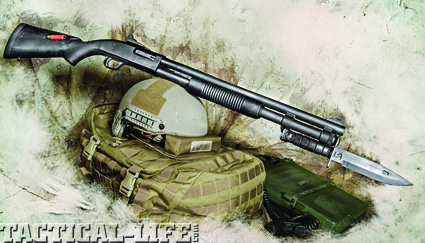 With direct input from the US military, Mossberg took another look at the 590 model. First and foremost, the thickness of the 590’s barrel was examined. Due to extensive deployment on ships where the risk of denting standard-thickness barrels on bulkheads or steel decking was a real concern, the barrel wall thickness was beefed up to address this potential problem. In addition to a thicker barrel, the synthetic receiver-mounted safety and trigger housing were redesigned to be manufactured from aluminum alloy, resulting in much tougher parts with little to no additional weight. The result was the Mossberg 590A1, a specialized variant of the 590 series designed specifically for heavy-duty LE/military applications and the US military’s specific needs.